Dimensions 0.50 by 6.50 by 11 in. 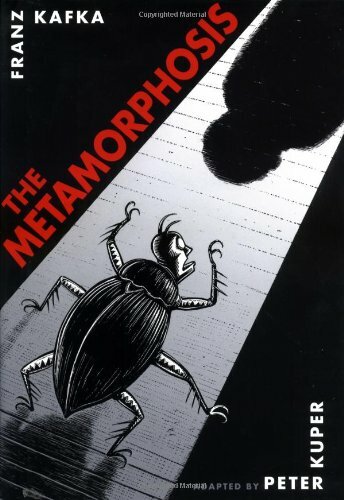 A seemingly ordinary man, Gregor Samsa wakes up one morning only to discover that he has been transformed into a gigantic insect and must deal with the depression over his new physical alteration, as well as the rejection of his family, in a new graphic novel rendition of the literary classic. 25,000 first printing. Amazon.com description: Product Description: A brilliant, darkly comic reimagining of Kafkaâs classic tale of family, alienation, and a giant bug. Acclaimed graphic artist Peter Kuper presents a kinetic illustrated adaptation of Franz Kafkaâs The Metamorphosis. Kuperâs electric drawingsâwhere American cartooning meets German expressionismâbring Kafkaâs prose to vivid life, reviving the original storyâs humor and poignancy in a way that will surprise and delight readers of Kafka and graphic novels alike.